Here’s the pattern, very cute but my scale didn’t turn out like theirs at all. 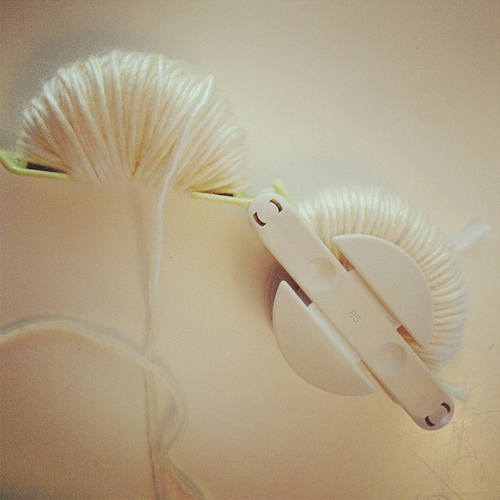 Check out the pattern on ravelry to see other knitters’ notes! That hat looks just fine to me. Pompom is the right size, nice and full. Of course, with my small head I still manage to be convinced I could fit that hat even though I’m not a 2-year old. Pom pom size looks great! I’m sure Simon will be adorable. I love this hat!! Is there a pattern for it?? Ravelry name? I vote for the pom pom too. Perfect hat (such a great colour!) and pom pom for a little boy, I think. 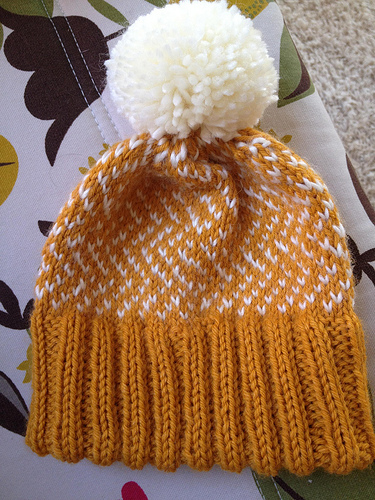 I kind of love everything about that hat- the pattern, the colour, the pompom! I’ve only just started knitting (I’ve made a scarf); is it something appropriate for beginners? Any info in regards to pattern and yarn you’d be willing to pass along would be greatly appreciated. Thanks!